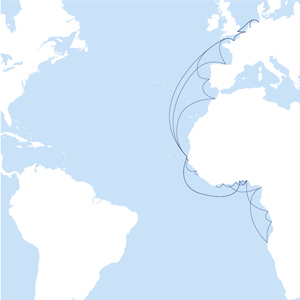 Since the mid-1970s, the Grimaldi Group has been the largest carrier of vehicles between Europe and West Africa. On these routes the Group operates 22 modern Multipurpose Ro/Ro Car Carriers, each of them able to accommodate about 2,500 lane metres of rolling cargo, up to 2,500 cars and 850 containers on the weather deck. Ships are fitted with their own deck cranes to handle containers, project and oversized cargo. With a departure every two days from Northern Europe, the Group offers an unrivalled set of four different services – Northern Express, Central Express, Southern Express and Eurocargo Express – which directly serve a total of over 20 ports in the region. In support of its shipping services, the Group has built a network of offices throughout West Africa, with landside logistics and car storage facilities operating in the main port areas. The Grimaldi Group's regional transhipment hub is Dakar (Senegal) while a US$ 60 million investment has been completed in Lagos (Nigeria) to build what is Africa's most modern Ro/Ro terminal. Operational since mid-2006 and called Port & Terminal Multiservices Ltd (PTML), the terminal provides the highest international standards for vehicle handling, storage and logistics. The second phase of development has been completed. PMTL currently features two berths for deep-sea vessels, more than 210,000 square metres of yard, and supporting off-dock storage areas of 100,000 square metres water connected to main terminal, state-of-the-art facilities and equipment.